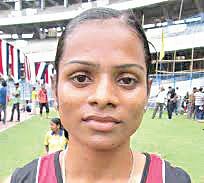 CHENNAI: Sprinter Dutee Chand was dropped from the 33-member squad for the Commonwealth Games on Tuesday, after reportedly undergoing a gender test. Contacted by TNIE, Dutee said she had no clue about the nature of the test. “A few days ago, I was taken to the hospital and asked to give tests. They said it was a routine check-up before the World Junior Championship, which will be held from July 22-27 in Oregon. I don’t know what the test was about,” she said. The 18-year-old has won many laurels on the junior circuit and was looking to make a mark worldwide. However, her future remains in doubt till the results of the tests are made public. “I don’t know who to turn to for help. My coach N Ramesh has left for Glasgow with the relay team. I called up my sister to ask for help but she doesn’t know who to approach. I have nobody who can be of any help in the camp and I don’t know which official to get in touch with. “I have participated in many tournaments and given many tests but have never come across any such problem. Running is my passion and people seem to have a problem with it. I don’t know about these tests but all I want to do is run for my country again,” she said.